Replace is proud to announce the launch of Nomi Snacks! Simply Fresh. Preserved by Cold. Finally, a bar that’s made to eat, not sit on a shelf! It’s a nutritious snack with a fresh taste and soft texture. 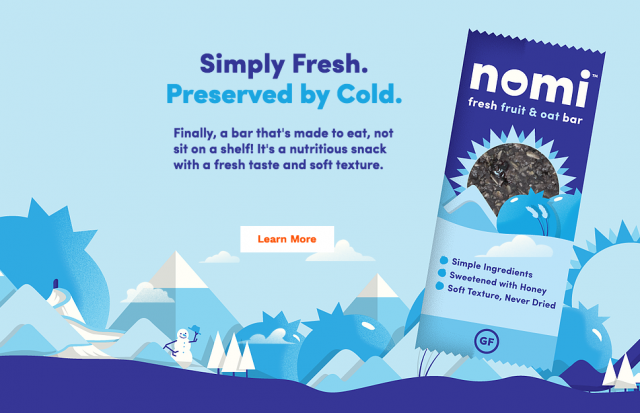 For the past year, we have been lucky enough to have been working on the naming, brand design, illustration, packaging, and basically everything else of the Awesome Folks at Nomi!!! The new site just launched! Nomi Snacks are the HEALTHIEST and the MOST DELICIOUS snack bar you are ever going to find. Trust me on that one. Oats & Fruit! That’s it. In 2012, a group of high school friends walked into a community kitchen in Minneapolis with the goal of making a better granola bar. Sick of eating the same old stuff, they developed a recipe with oats and fruit that actually tasted like something they’d want to eat. Find nomi in the refrigerated section, the natural location for all things fresh. We don’t dry out our bars or add alarming chemicals to make them last forever because we think good food should be made to eat. We are EXTREMELY proud of this new work we have done for the great folks at NOMI !! !